As an agent you know the importance of good quality pictures of the homes you are trying to sell. However, every once in a while you are out and about and see a home that would be perfect for a client of yours, but you realize you do not have your camera with you. No worries! As long as you have your phone you can still snap some great photos to share. Being armed with just your smartphone actually gives you the ability to quickly show case a listing or highlight a special property for a client. July’s Florida Realtor Magazine has an article on Smartphones and Tablet Pictures that was written by Bridget McCrea. 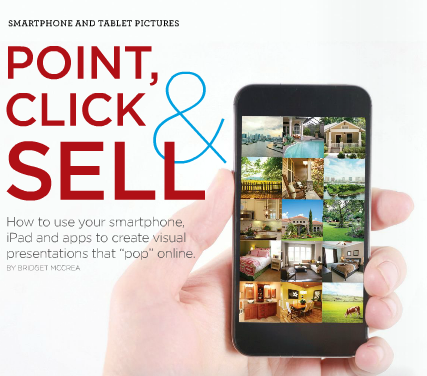 The article: Point, Click & Sell was all about creating a great visual presentation for your clients with smartphones. After reading this article I have listed a few of my favorite tips for taking better pictures with your smartphone that I think could be beneficial to all Real Estate Agents as it can save you time and money. Photo property of Florida Realtor Magazine. All rights Reserved. In a recent blog post I shared my excitement with the June addition of Florida Realtor Magazine. There were so many articles that gave me so many Ah Ha moments and ideas that I wanted to share with you. 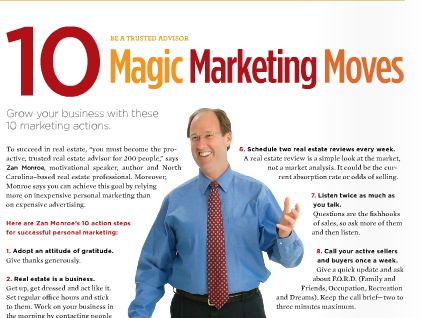 The article was called “10 Magic Marketing Moves”. Zan Monroe who is a motivational speaker, author and real estate professional in North Carolina, shares his 10 action steps for successful personal marketing. For those of you who are attending the 2013 Florida Realtor Convention and Trade Expo in August in Orlando, Zan will be presenting at three educational sessions. Winged Foot Title will have a booth again this year and Chris Black, attorney and owner will be speaking as well.